Solar powered this animal repeller from Kingavon has a Passive Infrared sensor (PIR) which detects motion and triggers the in built ultrasonic speaker to emit a tone which is not audible to people but is loud enough to scare away animals and prevent them from entering the grounds of your property. The Solar Repeller is effective in combating against unwanted visits from cats, dogs, foxes, badgers and even squirrels and mice. Great for preventing your bins or garden crops being paid unwanted visits or in helping prevent your garden from being soiled the solar repeller is a great alternative to inhumane animal traps and poisons. Easy to set up and use this simple and effective robust repeller comes ready to use and fitted with 4 X AA NiCD rechargeable batteries. Manufactured from ABS material the solar animal repeller is a safe and humane way to keep unwanted animals away from your property and will effective cover an area of up to 2425sq ft. It is fully waterproof with a IP44 rating and is fully CE certified. 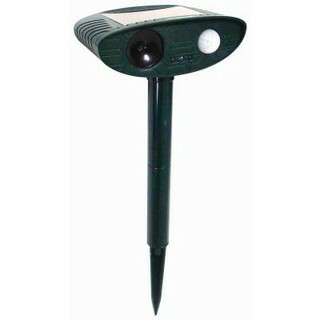 The spike on which the Solar Animal Repeller is placed has an above ground length of 26cm.